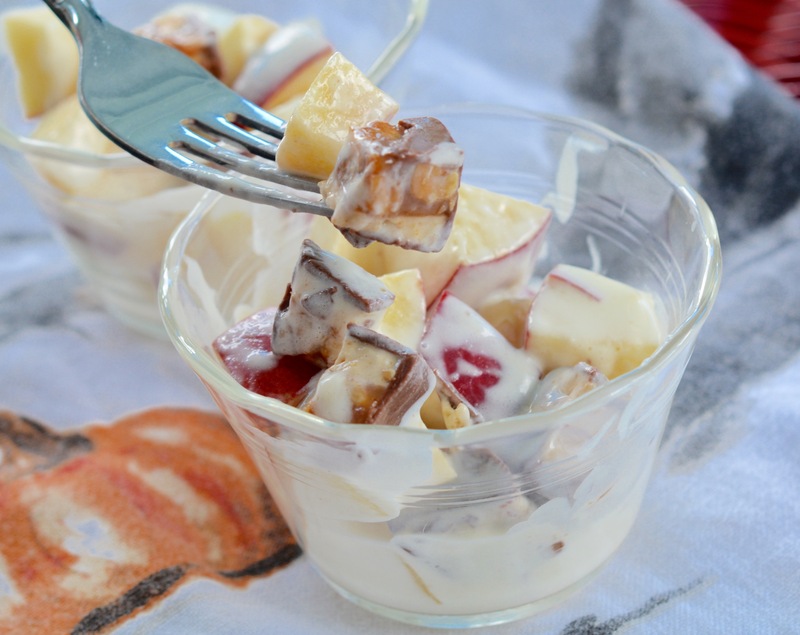 Snickers salad is one of the best kind of naughty and nice dishes to bring to a gathering. It is full of fresh crunchy apples, pudding, whipped cream, and, you guessed it, Snickers bars. You can even take it a step further and add toasted walnuts, caramel sauce, and more if you’d like. My favorite addition is salty crushed pretzels. They add an extra element of crunch and salt! Even if you don’t add the pretzels you will adore this salad. This is also a fantastic way to use up Halloween candy once the trick or treaters are long gone. It is a crowd favorite that everyone loves! Step 1: Prepare the instant vanilla pudding in a large serving bowl according to package directions. Fold in the whipped cream, chopped apples, chopped Snickers bars, and crushed pretzels. Toss everything well once or twice so the ingredients are evenly incorporated. Cover the bowl with plastic wrap and chill it in the refrigerator for at least 1 hour, or up to 2 hours. Do not chill for longer than this or the salad will get mushy. Step 2: To serve, remove the plastic wrap and let friends scoop out the salad with a large spoon to serve themselves.